Born in Australia, Nathan Tasker has been one of my favourite homegrown artists, with his albums A Look Inside and Must Be More being two of my favourite albums ever of the 2000’s! With hits like “Your Love Changes Me”, “Like You Love Me”, “Floating”, “Narrow”, “I Was There”, and more recently “Eternity”, “Love Is The Compass” and “Something Beautiful” from the 2011 album Home; Nathan has wowed us all with his though provoking, emotional and personal tracks of joy, sorrow and meaning, as he invites us onto a journey of discovery of ourselves, and our purpose and meaning, as we remember the promises of our Saviour and King that He will never leave us. With Nathan releasing Man On A Wire this week, with songs on this album influenced by events of sorrow and loss bringing growth and strength of character, this newest collection of laid back, acoustic songs akin to the genre of Andrew Peterson, Bebo Norman and Jason Gray, is one to listen to over and over. With Nathan already having toured with the Newsboys, and also touring with Michael W Smith later on in 2014 and in 2015, this album is sure to gain many more fans and followers, as Nathan’s stardom in the U.S only continues to rise and rise! Opening the track list is the one minute prologue “Trust You In The Darkness”. Led by light electric guitar, and soft acoustic guitar strums, the simply written poignant and moving melody showcases Nathan in a desperate situation, and crying out to God ‘…so please don’t let me give up hope tonight, You’ve promised mercy comes with morning light, so I, I will trust You in the darkness…’. As Nathan reminds us all that even in the hard and tough times we can and should look to God, the album moves onto the more upbeat and guitar led pop/rock title track. Lyrically and thematically about trusting and believing in God’s promises and faithfulness, like how the man who walked across Niagara Falls trusted the wire completely, we are reminded through Nathan’s inspiring melody and stirring vocals that Jesus deserves to be trusted because of the truths in the Bible. As Nathan asks God to ‘…come and be my light in the darkness, and I will follow You…’, we are given a glimpse into how our relationship with God should be- counting on Him always and trusting Him like we have never trusted anything before! All throughout the rest of the album, Nathan packs a punch emotionally and lyrically, and reminds us through various genres that Jesus is the author of our lives and the One who can and should be praised regardless of our circumstances. The synth and keys driven pop tune “Closer” speaks about God being close to us, and never forsaking us, culminating in Him meeting us in heaven at the end of our lives. As Nathan encourages us and sings out that ‘…every breath, every step, on my journey…every time I open my eyes I see that I’m not alone, You get closer…’, there’s a sense of peace that washes over me as I am reminded of the promises of God that He is with us and is working no matter the situation. The more stripped back, reflective and contemplative “Sowing Tears” delves into the inadequate emotions that Nathan feels about various topics in the world, but also brings hope with it- the acoustic guitar led song gives us reassurance that even the most direst of situations can bring with it a seed that can sprout into a majestic flower (symbolic of any silver lining in life!). Thematically similar to Steven Curtis Chapman’s “Beauty Will Rise”, this is a highlight of the album, as it is a real, honest moment of Nathan, reminding us that us Christians do not have it all together all the time. “Rise”, is an acoustic guitar led mid tempo danceable pop ballad, where Nathan sings out a declaration, that we will rise and show the world our faith, and our belief that Jesus is God and Lord over our lives, especially in this day and age where there is political and economic turmoil around the world! On the other hand, “Nowhere To Be Found” takes the tempo down a bit, as Nathan voices his anger and disappointment to God, asking God where He was when his daughter, son, and father-in-law all passed away in 2011. A morbid song if you look at it at face value, we remember that the declaration that ‘…You were nowhere to be found…’ is what Nathan was feeling at a moment, and isn’t the reality. Jesus was there, and though Nathan and his wife did heal, there were still questions as to why God didn’t heal their pain while others around them were not suffering as much as they were. Though answers weren’t immediate, this song is kind of therapeutic for Nathan, and is one of the most personal songs yet in his entire career! After this harrowing look at one of the most personal, emotional and devastating time in his life, Nathan reminds us that in a soft acoustic guitar ballad of “Whole World”, that ‘…You got the whole world in Your hands, got the whole wide world in Your hands, and every little thing is under Your command, so I will trust Your plans…’. A song in response to the passing away of his children, which is more positive than the song before, Nathan sings out truth and reminds us that God is constant all the time, an aspect of faith that Nathan obviously hung onto during the times when he had nothing else left to hold onto. Bringing the tempo back up, the acoustic guitar, pulsating drums and vibrating synth and electronics led “No Good Reason” celebrates how God loves us so much that He pours out His love for us for ‘no good reason’, except for The Reason that we are His children and He loves each of His children immensely. Paying the price on the cross, we are truly indebted to Jesus, and are filled with gratitude and thankfulness, as Nathan eloquently reiterates in this honest and encouraging track! Well done Nathan for an exemplary track that places the focus right back on Jesus rather than our ever changing circumstances. The quiet, piano and synth led acoustic guitar featured ballad “You Will Not Forsake Me” is a story song, with the verses speaking about various people in the seemingly most hopeless of situations, all claiming and declaring in the chorus that Jesus will not forsake them and with be with them always. A gentle reminder that we are not alone, even if God seems to be absent, this is a song that reminds of why God is the perfecter of our faiths and the One who alleviates our troubles, as He meets us in the midst of our struggles, and comforts us, while not necessarily healing us instantly, but being there and walking with us, which is more important to us that we will ever really know. Immediately singing out ardently and fervently ‘…in the valley of our suffering, when the darkness steals our light, in the moment of our breaking, there our hearts will still decide to find a song, when there seems none…’, the emotional, personal and poignant “All The While” is thematically on the same or similar vein to the rest of the songs on the album- trusting God in the midst of devastating trials and tribulations, and Nathan’s heartfelt sadness, resolute hope and trust in God all interwoven isn’t hard to miss, and moves us deeply as we think about what we’d do in Nathan’s situation of rediscovery of faith and Jesus. The final song “Voice I Long To Hear” brings the subject matter back to something more positive to end the album with. The acoustic guitar prominent melody speaks about Nathan being angry at God and questioning Him about certain decisions and situations that he doesn’t agree with, however ultimately longing to hear from God, and letting us know that God is the voice that Nathan longs to hear, despite the outcome of the answer to the questions. A transparent, emotional, and personal album that is the most dynamic and honest in Nathan’s career, Man On A Wire is an album to savour, and an album that you should definitely listen to. It will strengthen your faith and serve as a great introduction to the Aussie singer/songwriter if you haven’t heard his albums before! “…It’s been an immense privilege to hear the stories of others, as they share after shows and over email. And I’m reminded time and time again that our world needs to hear of the one true hope that can only be found in Jesus, now more than ever… My hope is that this album would be honest and authentic, and representative of the entire Christian life, one in which our God uses the full spectrum of colors – emotions, experiences – at His disposal to shape us and make us more like His Son, Jesus…” One of the most personal albums, where there is a lot of doubt present, yet also quite a lot of faith shown as well, Nathan Tasker has released one of the most lyrically and thematically challenging albums all year. 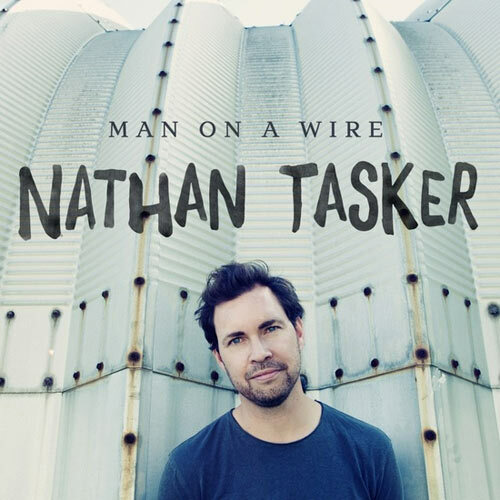 Produced by Paul Moak, Nathan’s album Man On A Wire is bound to bring someone to Christ, and I guess that’s all he can hope for when creating a brilliant batch of songs like these. If you’re struggling, you definitely need this album, but even if you’re not, this album can still minister to you. And with that, I say, that Nathan has done a fantastic job, and I can’t wait to hear what else if next for you! But until the next album, let’s just have this album on repeat on iTunes and on our phones, shall we?